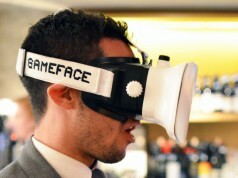 GameFace Labs may very well be the furthest along in the quest to create a mobile VR headset. Based on Android, GameFace Labs has been working hard to iterate on their prototypes, their latest is the first VR headset (mobile or tethered) to include a 2.5K display, with 78% more pixels than 1080p based VR headsets like the Oculus Rift DK2. And they’ve got even more surprises up their sleeve. Update (4/8/14, 6:14PM): All references to “2K” have been updated to “2.5K” to more accurately represent the resolution of the display. If you ever see a tall guy dressed in a suit, strapping a white VR headset to every face he can find, you’ve almost certainly stumbled upon GameFace Labs CEO, Ed Mason. You’ll know for sure when you hear the U.K. accent. Every trade show I’ve been to in the last 6 months has had one consistent factor—Mason hustling the venue with seemingly unstoppable energy. With two of the company’s unmistakable white GameFace prototypes, he prowls the shows, spreading the good word of mobile VR. And he has good reason; GameFace Labs may very well be the furthest along in the quest to create a truly useable mobile VR headset. 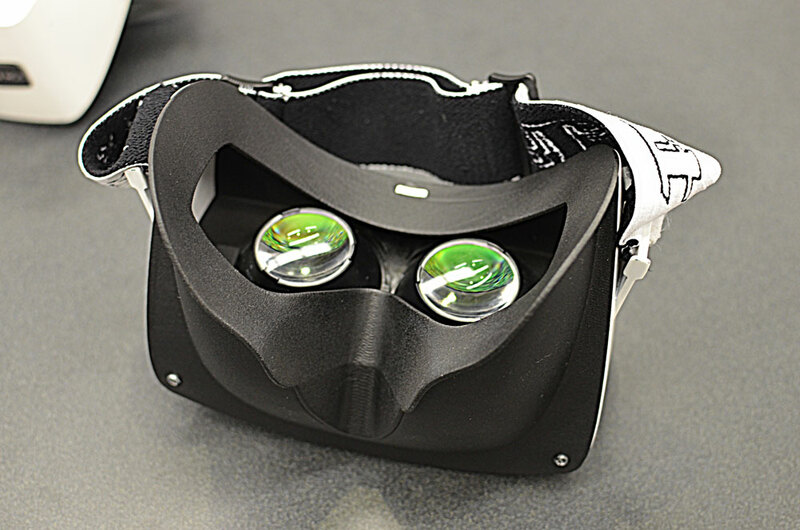 Yes, the lenses on their early prototypes are stolen from the Oculus Rift DK1! The latest milestone in that race has been crossed first by GameFace. The company is the first to show off a prototype equipped with a 2.5K display, shown for the first time last night at the VRLA Meetup. The display is, of course, from an unspecified manufacturer (screen makers love their secrets), but what we do know is that it’s a 5.5-inch panel with a resolution of 2560 x 1440 (~534 PPI). It’s an LCD display, but I’m told that GameFace is targeting low-persistence down the road. 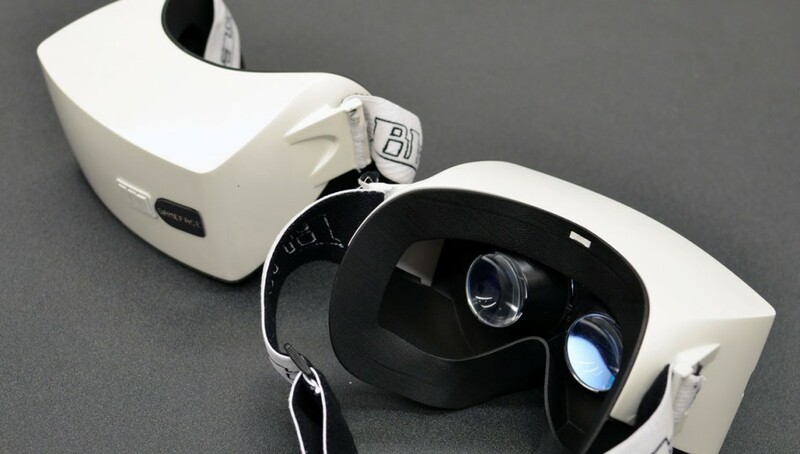 Mason says that he and his colleagues are in agreement that a 2.5K display will be the “entry-level requirement for HMD manufacturers entering consumer VR …” The company says they expect to use something similar in their forthcoming dev kit. GameFace Labs isn’t stopping at 2.5K. They’re also working to source the most powerful mobile hardware they can get their hands on. The two white prototypes that Mason has been touting around as of late are based on the Snapdragon 800 and Tegra 4 platforms. I’ve tried both, and they work. But Mason and Co. are on a quest for more power, and they’ve got it now with one of the most powerful mobile chips available. The Tegra K1 (also known as ‘Jetson’) is a SoC (system-on-a-chip) that combines a quad-core ARM Cortex CPU (up to 2.3GHz) with a 192-core GPU. And if GameFace want to push the resolution even higher, K1 supports up to a 3840 x 2160 LCD. Nvidia calls it the “world’s most advanced GPU,” part of that claim coming from the fact that it can run Unreal Engine 4 along with DX11 support…. all at 5 watts. And this isn’t just a “we plan to use the K1” sort of thing… Mason has sent me photos of the K1 board that the company is now building into its latest prototype, which it intends to show at Penguicon early next month where they’re being awarded the ‘Hack of Honor 2014’. I’ve had the opportunity to try GameFace’s prototypes on several occasions, and each time I have, the experience has improved. It’s freeing and intuitive to have a mobile VR headset where you can let the rotation of your body determine the direction of your virtual self. The same can’t be done with tethered VR headsets like the Oculus Rift—where you generally always face the same direction, but use some form of unnatural input to rotate your virtual self—simply because you’d get tangled up in the cord. In addition to hardware, the company might be the furthest along when it comes to mobile VR content. At GDC 2014, Mason showed me a Dreamcast emulator running on the GameFace prototype. I was playing the cult-classic Jet Set Radio (2000), and to my amazement, they’ve actually natively expanded the field-of-view to create an immersive experience. They’ve also worked with Nick Pittom, developer of the Spirited Away VR experience, to bring that scene to the unit. This is in addition to a myriad of other demos, like several 360 degree video experiences which are surprisingly immersive. Every time I see Mason, he’s got some new content to show me. And one of the reasons I’m rooting for GameFace is that their pursuit could jumpstart the rest of the mobile VR world. Surely many of you have seen any of the numerous smartphone HMD adapters like VRase, Altergaze, and Durovis Dive (even VRelia is working on one). All of these work by sliding a smartphone into a housing and using its display and other hardware as the basis for a VR headset. But they all share a common problem… there’s hardly any content available. GameFace Labs seems well on the way to changing that, and because their product is Android-based, much of the content may be cross compatible with smartphone HMD adapters. Mason tells me that the latest GameFace SDK significantly reduces latency to a point that it is “easily comparable to the DK1.” The company plans to benchmnark their latency soon to get a quantitative latency figure. The GameFace SDK, which doesn’t require Unity Pro, is available to any developer who wants to reach out to GameFace Labs (info@gamefacelabs.com). GameFace is hoping to bring a dev kit of their mobile VR headset to market by the end of this year. Starting today, you can sign up at the GameFace Labs site to get in line for an early-bird unit, available one month before the general release (see the button at the top right). There’s no word so far on what the unit might cost, but my guess is that it will be more expensive than comparably speced tethered HMDs, given that it has to have all of the hardware on board. It will be interesting to see, however, when the cost of a powerful gaming computer is added to the equation, which one ends up being cheaper…. GameFace Labs, which is based in the U.K. has shared with Road to VR that the company recently secured an unspecified amount of funding, apparently enough to expand operations into the U.S. and hire some SoC engineers. Given their head start, I’d be surprised if an interested company looking to get a jump on mobile VR doesn’t swoop in and scoop up GameFace Labs in the near future. There’s a good chance we’ll be seeing GameFace’s latest 2.5K + K1 prototype for ourselves next month. Stay tuned. This in a nutshell is the generic reason that Oculus had no choice but to sell itself to someone with infinitely deep pockets if they are to prevail. I’m less concerned with Zuckerberg than a lot of people are. He’s not directly responsible for the draconian monetization Facebook has employed, that’s entirely Sheryl Sandberg’s domain and he hired her to divest himself of having to even think about it. I think he remains a fairly simple geek that will pour whatever it takes into Oculus to make it the best experience in terms of both technology and content that it could be. The child in him just could not resist and will prove a boon to VR as a whole. I’m sure Sheryl will prepare a detailed road map to monetization of what Luckey and Zuckerberg produce before she leaves for the political arena. I was really impressed with the GameFace last night. 2.5K is great. The lack of distortion correction was a bummer, and the lenses obviously are crying for an upgrade, but it sounds like the K1 unit will be a force to be reckoned with. If they can figure out a way to do position tracking they’ll really be nipping at Oculus’ heels. Sorry I missed you last night, would have liked to have met in person. Great story! Totally rootin for these guys. Unlike a certain other “me too” console gaming company, Gameface is actually trying to move the ball fwd. Untethered is def the future of VR-HMD’s, and yes, it certainly does provide a way to negate the artificial rotation with a mouse or gamepad (which is the WORST trigger of sim sickness for me) Cloudhead has created their VR Comfort Mode which is def an improvement, but I can see VR users sitting on their swivel chairs using an untethered HMD, and totally negating the need for unnatural L+R pan controls. If Nvidia can provide a sys-on-a-chip that will run Unreal Engine 4, then, WOW! Kickass untethered VR is coming fast……exciting times we are living in! It’s funny how fan-boys like you (not real fans of VR) accuse just Sony (it seems) of “me too” syndrome when Sony has been developing their own HMD for their own gaming console since 2010, undermining their effort to get the ball rolling for VR, and overlook the fact that these new guys (more HMD companies coming) stole the optics from the Oculus DK1. Everyone feeds off each other. Who cares? Its just better for VR. All HMDs will be wireless and self contained with 4K per eye and 200 degrees of horizontal FOV before we know it. I owned a Sony Glaston in 1998– so Sony has been in the HMD since the 90’s at least… I also visited the Sony Theatre in New York City some time in the 90’s which had a 3D movie and they provided electronic shutter glasses for audience members. You know I meant Sony GlasStRon. They really need to get positional tracking to work as a lack thereof is a recipe for motion sickness. Personally I am not a fan of Android/IOS based VR. The Tegra might be fast but desktops will always be one step ahead. It will be great for “casual” gaming though. 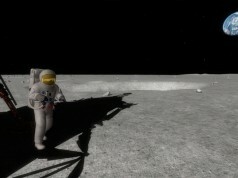 Actual prototyp is 1080p with 100° FOV. The commercial version this summer would be 1440p with 130° FOV. 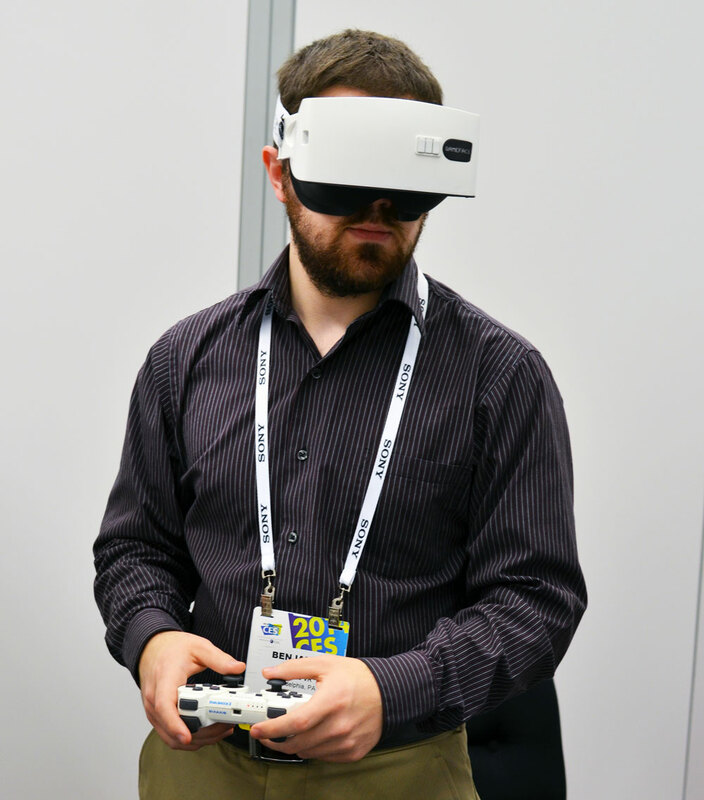 It’s a wireless VR/AR headset to use on PC/Linux with Catia, Virtools, Unity applications or Android OS. Equipped with : Frontal camera, Active tracking, Accelerometer, Gyroscope, Magnetometer, GPS, Electronic focus adjustment, Audio and USB in/out. I’d take this over the oculus [sellout] rift anyday. Gameface actually realise the importance of being able to MOVE. Oculus can add all the bells and whistles they want, if you are tied down to your chair there’s literally no point in using VR at all. Very low graphical power and no positional tracking, not interested. Never heard of cockpit games ? @Onetazien : no need for name calling. (Fanboy). 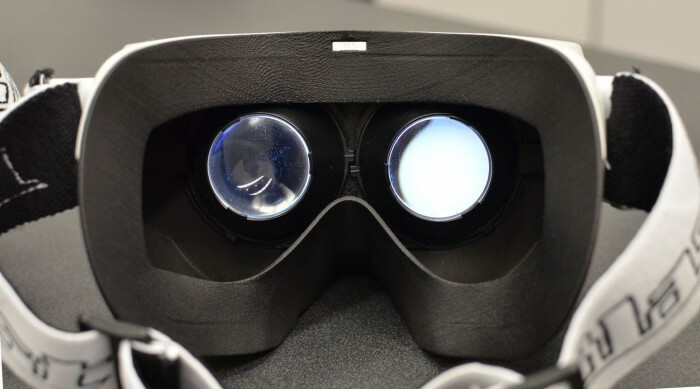 The ball for VR “is” rolling, and it was Palmer Luckey & John Carmac that got it rolling. If Sony can be undermined by my “opinions” on a user forum, then they are in big trouble. I’ve seen the HMD’s that were being developed for the console, and they were missing the mark, big-time, until the DK1 became available to everyone. I am rooting for other companies to succeed, because I think it’s better for consumers to have more options. Sony has dominated the gaming arena for a very long time, and they will obviously be a major player in VR, by leveraging their massive foothold with the PSN. The difference between Sony and most other players in the VR revolution, is that Sony isn’t sharing ANYTHING. Oculus/Valve/Sixense/Cloudhead/Gameface/Tech Illusions/Tactical Haptics/Omni, etc…are all sharing and iterating in a VERY public and open fashion. That’s, the difference. BTW, I have been buying and using Sony products for many years, it’s not like I’m calling for a friggin boycott on them! So, let’s keep this forum about communicating/sharing ideas, and not about name calling.